Conservationists on Monday captured a rare one-horned rhinoceros in Nepal as part of an attempt to increase the number of the vulnerable animals, which are prized by wildlife poachers. Five rhinos—one male and four female—will be released into a national park in Nepal's far west over the coming week in the hope of establishing a new breeding group. 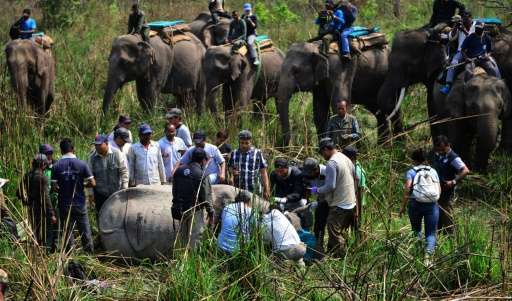 The first, a large male estimated to be around 12 years old, was located by rangers in Chitwan National Park after a four-hour search on elephant-back. "He is one of the dominant males in this area," said park chief Ram Chandra Kandel. The team of vets, wildlife experts and mahouts hope to capture a second rhino later Monday before departing for Shuklaphanta National Park, a 12-hour drive away. It will take at least a week to capture and transport the remaining rhinos to their new habitat, which is already home to an estimated eight of their kin. 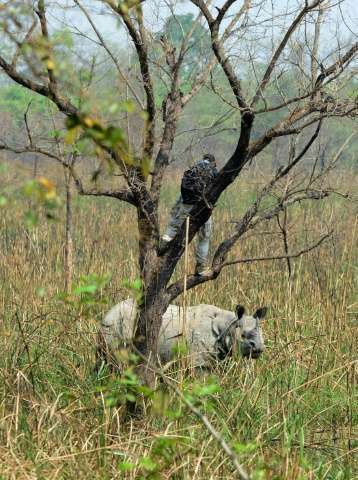 The first group of rhinos was released into Shuklaphanta in 2000, Dr Kanchan Thapa, a biologist from conservation group WWF, told AFP. The latest rhinos are needed to replenish the population, he added. Thousands of one-horned rhinos once roamed the southern plains of Nepal but rampant poaching and pressures of human encroachment reduced their numbers to around 100 in the later part of last century. There are now around 645 after a government-led conservation push in the years since a 10-year civil war ended in 2006. Poaching has declined significantly in Nepal, with only a few cases in recent years. A rhino died last year after being shot by poachers, who were intercepted by authorities before removing its valuable horn. Rhino horns can sell for tens of thousands of dollars on the international black market, where they are used in traditional medicines in China and Southeast Asia. Rhino poaching carries a maximum penalty of 15 years in jail and a 100,000-rupee ($1,000) fine in Nepal. The other significant population of one-horned rhinos is in the Kaziranga National Park in northeastern India, where there are believed to be around 1,200.